An uncorroborated segment on "Fox & Friends" has sparked an international incident. At issue: Whether Judge Andrew Napolitano's anonymous sources were right about former President Obama using the British to spy on President Trump. Amid widespread disbelief and utter denials of the explosive charge, Napolitano "stands by his report," Fox News said Friday. But one of the network's top news anchors, Shep Smith, said "Fox News cannot confirm Judge Napolitano's commentary." So was it a "report" or was it commentary? There's a big difference between news and commentary about the news. Fox's blurry lines are partly to blame for the current controversy. On at least three occasions, Napolitano cited Fox News "sources," giving his claim the imprimatur of the network as a whole. It's unclear if Fox's news division vetted his sources ahead of time. Political anchor Bret Baier repeated Smith's point on Friday evening, saying "the Fox News division was never able to back up those claims." But the claims were reported on one of Fox's newscasts earlier in the week. Napolitano, a Fox News veteran, is the network's top judicial analyst. Trump, a frequent Fox News viewer, is familiar with Napolitano's TV segments. On Friday, Trump called him "a very talented lawyer on Fox." Shortly before inauguration day, Napolitano had a one-on-one meeting with Trump about Supreme Court nomination possibilities. Napolitano went on TV afterward and reported on the meeting. He did something similar this week. On multiple occasions, he relayed what anonymous sources had told him about alleged wiretapping. The backdrop: Widespread skepticism about Trump's baseless claim that "Obama had my 'wires tapped' in Trump Tower." Napolitano's TV segments gave the president a boost. "Fox News has spoken to intelligence community members who believe that surveillance did occur, that it was done by British intelligence," he said on the Fox talk show "Outnumbered" on Monday. Note the use of the word "believe." He did not indicate that his anonymous sources had proof or first-hand knowledge. But he raised the stakes by saying "if Barack Obama used a foreign intelligence agency to spy on an American who happen to be a candidate for president and then president-elect, we have a very, very, very serious criminal issue on our hands." Seven hours later, his story shifted a bit. On Fox's 7 p.m. newscast "The First 100 Days," he said "sources have told Fox that if then-Mr. Donald Trump" was surveilled, "it was done by a foreign intelligence entity," specifically the British. He reiterated to news anchor Martha MacCallum: "This is what sources in the intelligence community have told Fox." Eleven hours later, his story evolved further. Napolitano didn't say this was someone's "belief" and he didn't couch it with the word "if." Speaking on "Fox & Friends," Napolitano said "three intelligence sources have informed Fox News that President Obama went outside the chain of command, he didn't use the NSA, he didn't use the CIA, he didn't use the FBI and he didn't use the Department of Justice, he used GCHQ. What the heck is GCHQ? That's the initials for the British spying agency." Napolitano also shared the information on Fox's smaller sister channel Fox Business. 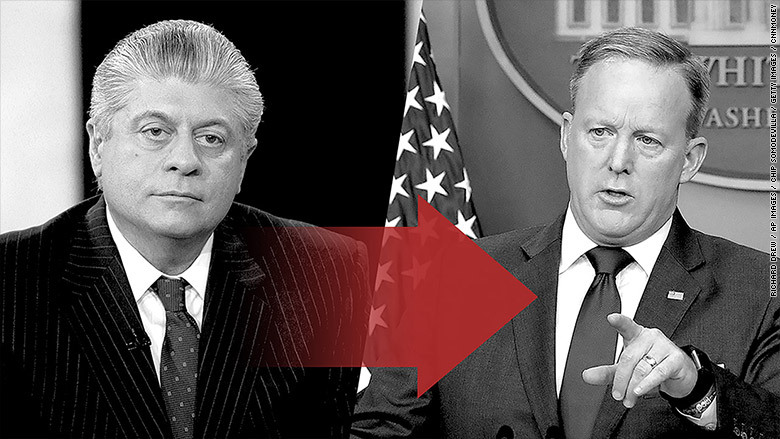 On Thursday, White House press secretary Sean Spicer read aloud Napolitano's appearance on "Fox & Friends" to back up the president. On Friday, Trump brushed off a question about the controversy by saying, "All we did was quote a certain very talented legal mind, who was the one responsible for saying that on television. I didn't make an opinion on it. That was a statement made by a very talented lawyer on Fox." Trump added, "You shouldn't be talking to me, you should be talking to Fox. Ok?" That's when Fox said Napolitano "stands by his report." The judge made the remarks on Fox opinion shows as well as a Fox newscast. He consistently backed up his assertions by saying the information was coming from Fox News sources. But Smith, speaking on Friday, contradicted that. "Fox News knows of no evidence of any kind that the now-President of the United States was surveilled at any time in any way. Full stop," Smith said.